Microsoft has launched a redesigned Xbox 360 console. The new console uses the same design language as the recently announced Xbox One console. This updated console will be available straight away to US customers but there is no price cut right now, the MSRPs remain the same as with the previous range of consoles. The new Xbox 360 is said to be smaller and quieter than any previous version of the Xbox 360. A quick gander at the main picture below will confirm the Xbox One design similarities to you. The shiny and matt textures side by side and the simpler black shape borrow a lot from the next generation console design. This latest version of the Xbox 360, originally launched in November 2005, will not bring with it a cut in MSRPs. 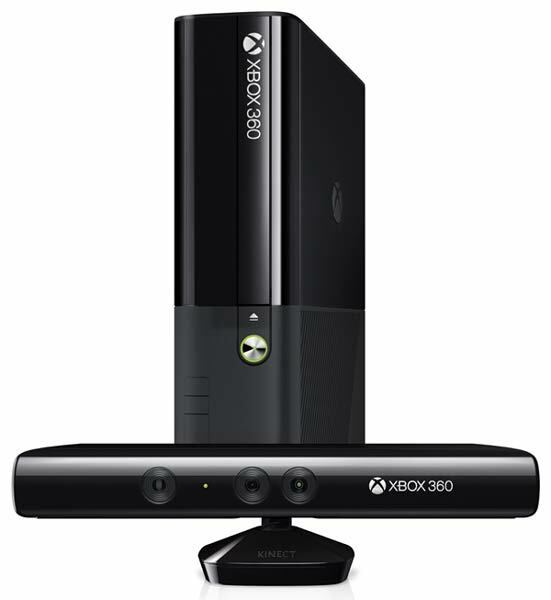 The 4GB model is to be US$200 and the 250GB or 4GB-with-Kinect models are US$300. These redesigned Xbox 360s are available from today in the US. Microsoft SVP of Marketing Yusef Mehdi said the company is committed to supporting the Xbox 360 for years to come. Several big name new games were announced for the 360 including; Metal Gear Solid V: The Phantom Pain, Grand Theft Auto 5, Splinter Cell: Blacklist, Dark Souls II, Final Fantasy XIII: Lightning Returns, World of Tanks and Batman: Arkham Origins. Microsoft also announced some sweeteners for Xbox Live Gold subscribers; from 1st July two free games will be available for download including titles such as Assassin's Creed II and Halo 3. I'm going to get one of these to replace my aging, hot and noisy XBox 360 Elite 120GB. Interesting approach from Microsoft in releasing a new XBox 360 with this two free games a month offer.. designed to keep the PS4 “out the bedroom” no doubt whilst the XBox One is aiming for the living room. Microsoft has launched a redesigned Xbox 360 console. The new console uses the same design language as the recently announced Xbox One console. That “design language” presumably being gobbledegook - since the XBone is in no way what I'd term “attractive”. :puke: As to the quieter bit - my XB360 Slim is quiet enough for me. Microsoft SVP of Marketing Yusef Mehdi said the company is committed to supporting the Xbox 360 for years to come. Think I'll maybe be able to afford that SGJ guitar for my Christmas present to me. :D That or a Haswell/IB crossgrade for the gaming rig, although if the latter then Microsoft will possible get some cash from me for a Windows8.1 license - but only if the LeapMotion is available. Anyone got any information about the range of titles on offer? Free stuff = good in my book. Although I'm wondering what the deal will be for my “Family” pack - it's got four XBLG subscriptions, so does that mean four free titles - I do hope so. …. with this two free games a month offer.. ..
For the rest of this year. It runs 10th June to 31st Dec only. You download during “specified half-month window only”, which I take to mean one game at a time, for two weeks each. Also, fine print says for “qualifying” Live Gold members only, but doesn't explain “qualifying”. As for the new XBox 360, good idea but have they “redesigned” the requirements in line with XB One as well as the appearance, such as net connection every 24 hours? If not, then I'd buy one if I need to replace the 360 (especially if it's significantly quieter), but if it has the same restrictions as the One, then it's dead to me, as is the One. The above comments come from the Live web page, the ** fine print at the bottom, for anyone wanting to know …. Only $100 less than a PS4 will be. I'll save my money.